CTRL. ALT. DELETE. A trio of abbreviations that have saved a fair few disasters for Windows users over the years, and got a lot of people out of a lot of holes. 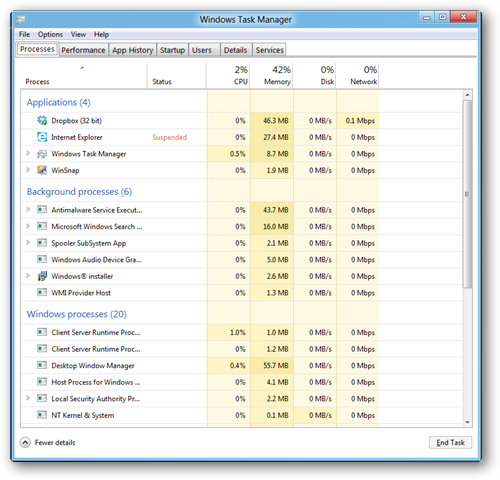 It’s something that’s often joked about, particularly by devoted Apple fanboys and those especially anti-Microsoft, but in truth, the subsequent Task Manager can be a particularly useful feature not just for troubled Windows users, but for power users too. 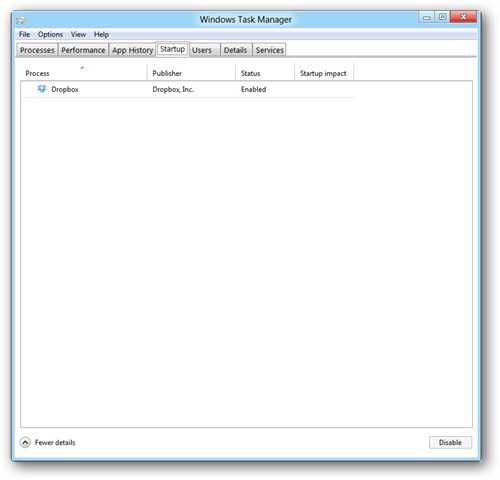 For Windows 8, like many other aspects of the OS, task manager has undergone somewhat of an overhaul, and though the changes aren’t as drastic as the switch to the Metro UI, which it goes without itself, the changes are noticeable and worthwhile. By default, the new Windows Task Manager has a new look. For any Mac users who have ever hit “CMD+ALT+ESC” to open the Force Quit Apps window, the basic view of the Task Manager will be extremely familiar, adopting an equally simplistic look with just a list of applications and a single button to end the process. Unlike the Mac equivalent though, there’s a whole lot more under the surface, even more so than on Windows 7, all in a simplistic new layout. The differences are all plain to see in the tabs along the top for starters, as you can see in the screenshot below. The performance tab has been given a whole new look with Windows 8, much like the rest of the OS it looks fresh and clear. With new line graphs dominating the pane, you get a more in-depth look at what’s been going on with your CPU, Memory, Hard Drive and Network, all color coordinated to fit the theme of the new Metro UI. Underneath the line graphs, there’s a load of other details which vary depending on which of the aforementioned categories is selected. Above the line graphs, you’ll find some relevant system info, such as which CPU you have, clock speed and under the memory tab, how much memory you have. Then, we have App History, which gives you a comprehensive account of what each app has been up to on your machine, what you’ve been up to with the apps from the perspective of a duration of use and the strain they’ve placed, even without them being running. From there you can switch back to any applications you’ve had open within that session also. This will benefit you in a variety of ways I’m sure, but for me, the key behind this is being able to diagnose a system slowdown, problems with individual apps, without having to go through each app individually and uncover the issues in a lengthy, pretty dull way. Alongside that, there’s the new startup tab, which places a convenient feature in a more accessible location. Before, finding your startup items were hidden away in MSConfig, which wasn’t ideal. 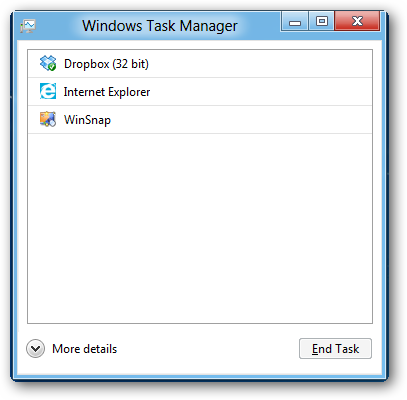 In Windows 8, this is in the task manager, and is beautifully simplistic, providing a simple list of all the apps that open with Windows. A key to maintaining a fast startup, and getting rid of any unwanted crapware which clutters up the otherwise smooth lightning-fast startup that Windows 8 can boast. This pair of tabs work more or less in unison to give you information on the processes happening on your PC at any one time, and how resource intensive they are. While this functionality was more than available in Task Manager prior to Windows 8, there are a few interesting additions and alterations. Firstly, the processes tab has a whole new layout, which is categories and colored to indicate intensity, for example, a disk usage of over 90% will burn bright red to inform you of the apparently dangerous levels. This same tab is now also categorized into applications, background processe’, and windows processes to help you keep more a track of what’s what and where’s where. One other new addition to the task manager, hidden within the context menus, is the ability to access the web with relevant searches. In either of the processes or details tabs, you can right click any entry and hit either ‘search online’ or ‘search the web’, and automatically be taken to Bing with a search of that process, opening a world of information on that process, which can help you in many instances find the meaning and origin of troublesome or unknown processes. 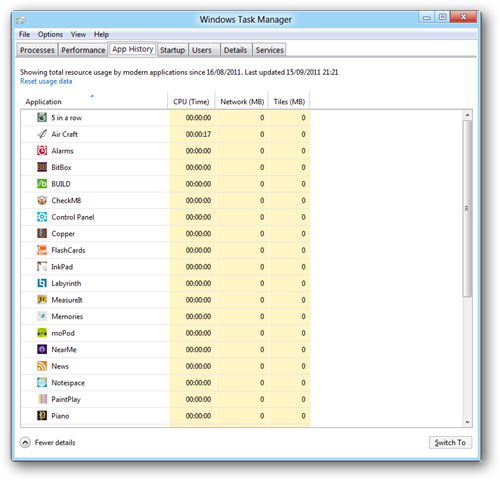 Is the new Task Manager in Windows 8 worth the effort? 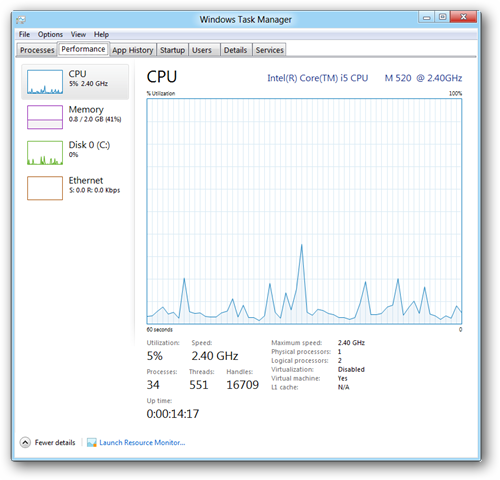 Task Manager is often an application that’s overlooked by the average user, but as far as diagnostics and monitoring your system goes, it can be invaluable. This is a refreshing update to Task Manager, which has stagnated in recent versions of Windows, adding clarity and some neat features which only help you achieve what it attempts to offer.